Pasadena Pro Musica was founded in 1964 by Edward Low, the Music Director of Neighborhood Unitarian Universalist Church. When Ed retired in 1999, he was succeeded by Stephen Grimm, who led the group for 19 remarkable seasons until his farewell in 2018. From the beginning, we have been committed to providing a place for musicians and audiences who appreciate great choral music that is not frequently performed. 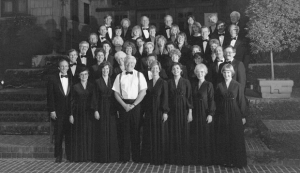 Originally called Neighborhood Chorus and Orchestra, the group was a pioneer of early music on the West Coast in the 1960s and 70s, performing long neglected Renaissance masterpieces by Isaac, Josquin, and others. Pasadena Pro Musica has performed many contemporary pieces and a number of world premieres, including works by Los Angeles-based composers Thomas Yeakle (for many years our composer-in-residence), Morten Lauridsen, William Kraft, John La Montaine, Elaine Bearer, Shawn Kirchner, Eric Whitacre, Richard Bing, Frank Ticheli and Rayner Brown. We enjoyed deep artistic relationships with two musical luminaries: composer Daniel Pinkham, who frequently guest-conducted his own works, and Jester Hairston, the celebrated songwriter, arranger, conductor, actor and leading expert on spirituals, and who regularly led the chorus in his own gospel arrangements from 1966 to 1992. Pasadena Pro Musica has also collaborated with artists from the world of theater and opera, presenting staged performances of Menotti’s Amahl and the Night Visitors with mezzo-soprano Suzanna Guzman, Jean Anouilh’s The Lark with music by Leonard Bernstein, and the wonderfully strange musical Boojum! based on the life and works of Lewis Carroll. Pasadena Pro Musica was part of Fulcrum Arts’ AxS Festivals “Fire and Water” in 2011 and “Curiosity” in 2014. The chorus has also appeared with Southwest Chamber Music, the Pasadena Symphony, and the Los Angeles Philharmonic in Mahler’s Symphony No. 8 at the Shrine Auditorium. We had the unique honor to be selected to perform in the multi-media Star Wars: In Concert at the Hollywood Bowl in 2012. Although Edward Low is an expert interpreter of early music and is a Baroque interpretation specialist, he is also one of the southland’s leading exponents of contemporary music. During his thirty-five year tenure as the founding artistic director of Pasadena Pro Musica, he has done much for contemporary music by producing premiere performance of works by American composers. The success and staying power of Pasadena Pro Musica is due to the succession of innovative performances of distinguished, yet less-frequently-performed masterpieces from all periods. The group also owes its success to Low’s own performances as conductor, scholar, organist, and interpreter. Whether performing rediscoveries of ancient music or interpreting contemporary scores, it was Low who set the tone and spirit for his ambitious and eclectic undertakings. Low came to Pasadena from Boston in 1964, following a distinguished career. 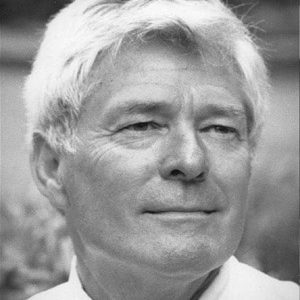 He was head of the music department at Pine Manor College and had been a faculty member in the choral conducting department of Berkshire Music Center at Tanglewood. His madrigal group was under management with Columbia Artists. As assistant conductor of the New England Conservatory Chorus, he assisted with chorus preparations for Charles Munch, Robert Shaw, and Erich Liensdorf. He graduated from the New England Conservatory of Music and completed other graduate studies at Harvard and University of Southern California. His teachers included Nadia Boulanger, Leonard Bernstein, Aaron Copland, and T. Tutius Noble. By age 5, Stephen started to compose his own tunes on the piano. In third grade, when his family moved to Pasadena, he began to sing in earnest. He was a member of the boy’s choir at St Philip the Apostle Catholic School, and he and six of his brothers and sisters sang the early and Renaissance music they had learned at school, touring in a minibus as The Grimm Family Singers. To this day, Stephen says, his heart lies mostly with early music. Stephen continued his study of music, piano and singing at Loyola High School, Thomas Aquinas College, Cal State Northridge and Cal State Los Angeles, studying with such notables as Paul Salamunovich. 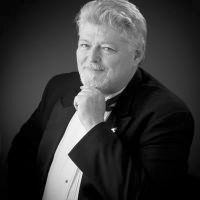 He has been a member of the Los Angeles Master Chorale since 1987, singing solos in such works as Britten’s Rejoice in the Lamb, Bernstein’s Chichester Psalms, and Christmas Oratorio with the Los Angeles Master Chorale. He has sung solos with the Los Angeles Philharmonic, including Bach’s St. Matthew’s Passion and the part of Prince Charming in a Disney Spectacular at the Hollywood Bowl. Keenly interested in fostering talent in young people’s lives, Stephen tutors privately and directs two choruses for youth (the Crown City Children’s Chorus for grades 3-8, and the Crown City Vocal Ensemble for grades 9-12) in addition to directing the adult church choir. As is fitting for the city in which he lives, Stephen has movie industry credits as well. You can hear him as the voice of a tornado in Twister, singing David Bowie’s Space Oddity in Mr. Deeds, and demonically chanting “Sanguis Vita Est” (“Blood is Life”) in Bram Stoker’s Dracula. Want to further support Pasadena Pro Musica?